Douglas County and Superior are a mecca for recreational opportunities offering four seasons of fun. Here, the history, culture, and beauty of these counties are marvels that must be experienced, not just witnessed. A variety of trail activities including mountain biking, snowshoeing, horseback riding, motorcycling, bird-watching, paddling – even downhill skiing are plentiful. Superior- Douglas County has an unbelievable variety of trail settings. Enjoy secluded trails in some of the most pristine wilderness areas in the Midwest. Travel road routes that run along Lake Superior’s sculpted shores, cross raging rivers and follow winding river valleys. Whatever brings you to Superior-Douglas County to have fun, be sure to check out the reports on the current conditions of our trails and availability of popular activities. In order for you to get the most from your visit, check back often as updates can change frequently depending upon the season and weather. 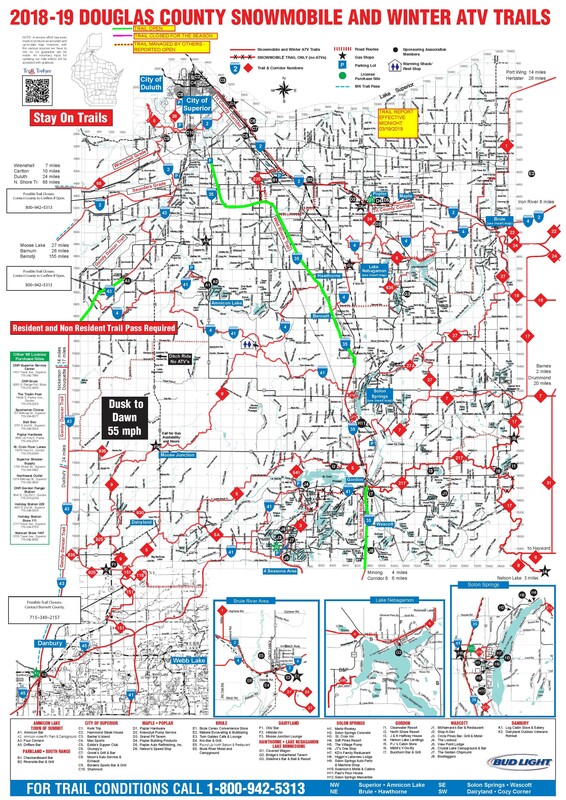 Want us to send you a FREE ATV/Snowmobile trail map? Click here! Effective Midnight on Tuesday, March 19th, 2019 we are closing the majority of trails under our management. Operating on closed trails is both illegal and may jeopardize our ability to use those lands for future seasons. Due to the recent warm temperatures and significant rainfall the trail base has eroded and the thawing snowpack has resulted in reduced quality trails. When leaving Douglas County or operating on trails managed by others within Douglas County, please contact the neighboring county, state, or trail operator to its regulations or status for ATV operation before entering the property. Thank you to all the members of the Northwest Trails Association for the tremendous amount of work it takes to open and maintain the trail network. THIS REPORT WAS PREPARED ON MONDAY, MARCH 18TH, 2019. Due to the deteriorated conditions, all trails are being closed to ATV/UTV operations. All trails maintained by the Douglas County Forestry Department are closed for the season. For further information, please contact the Douglas County Forestry Department at 715-378-2219 Monday-Friday 8:00 am to 4:30 pm excluding Holidays.